Every issue, landscape designer Darbi Davis digs deep to bring you stories for your outdoor space. In the second of a two-part series on gardening cooperative Flowers & Bullets, she finds a community warming to their mission. When Ramon Ramirez approached his grandmother, 84-year-old Nana Aggie Saucedo, with his gardening intentions, she was skeptical. Nana Aggie has lived in her neighborhood in South Tucson for decades and, says Ramon, is set in her ways. “My grandfather used to grow his own veggies like corn and citrus, and the loquat tree brought when they immigrated from California is still growing,” says Ramon. Ramon and friends helped organize a pot-luck BBQ at Nana Aggie’s house, reuniting her with many of her former students from the now-closed Julia Keen Elementary School, where she worked as a cafeteria cashier for close to three decades. “She connected with the kids and watched them grow. She retired before they shut down the school and witnessed the impact this closure had on the community,” says Ramon, whose work in Nana’s yard came about through his membership of Flowers & Bullets. Tito (left) and Ramon (right). Photo by Darbi Davis. The power of this sort of collaboration, sustainable multi-generational relationships, and edible gardens is what this cooperative grassroots organization is all about. Flowers & Bullets launched with a mission to provide an alternative to the food pantry and processed food that, while accessible and affordable, is ultimately detrimental to the overall health and well-being of a population. The cooperative’s efforts fill a void in the urban agricultural trend; through their grassroots approach they are building up trust with people who tend to lack faith in traditional programs. 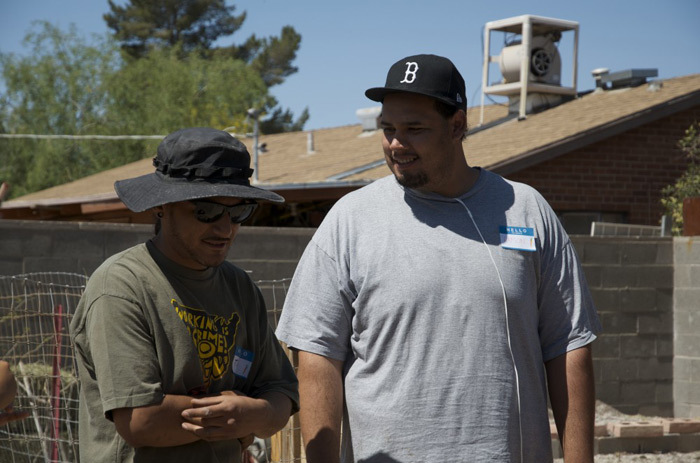 Through gardening and growing, they hope for community-building through education, collaboration, and skills sharing, and ultimately to shift the paradigm towards healthier habits. And their plan long term is to establish a curriculum relevant to all neighborhoods. It’s all very well that urban agriculture is the hot new thing, but are all pockets of the population getting to enjoy it? That’s something F&B would like to see addressed. 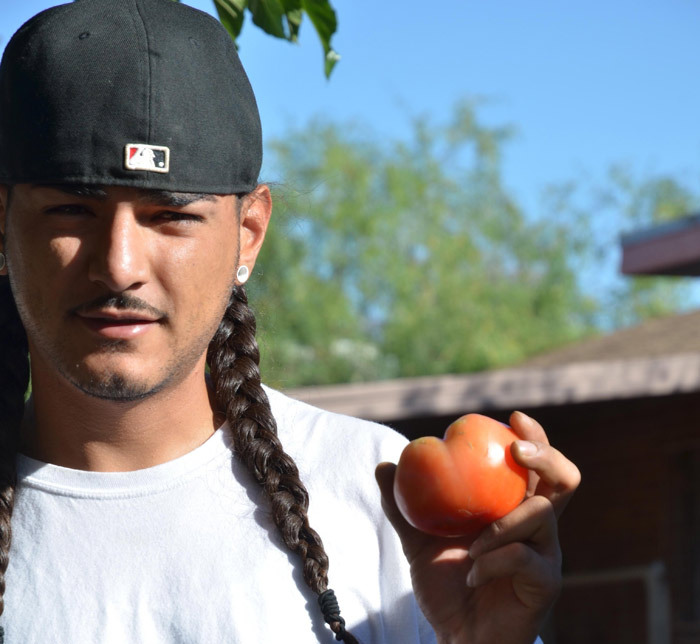 When Dora Martinez, a F&B member, attended her first public meeting on urban agriculture and city code changes, she saw a distinct lack of representation from South Tucson. “The Spanish translator suggested she go home because there were no Spanish speakers present. The population in need of urban agriculture was not present, and those who were present were not food insecure,” says Dora. Milking Rosemary. Photo by Darbi Davis. Greening gardens isn’t all that Flowers & Bullets has on their agenda. 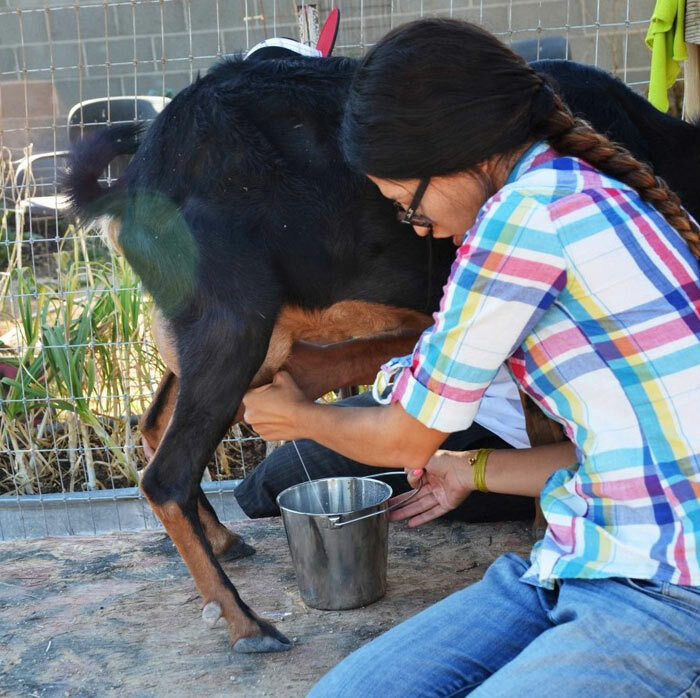 This past January they adopted three goats – a mother and two babies – giving the cooperative access to milk. And while laws say it’s not for human consumption, I can tell you it’s the best tasting milk I’ve ever had. 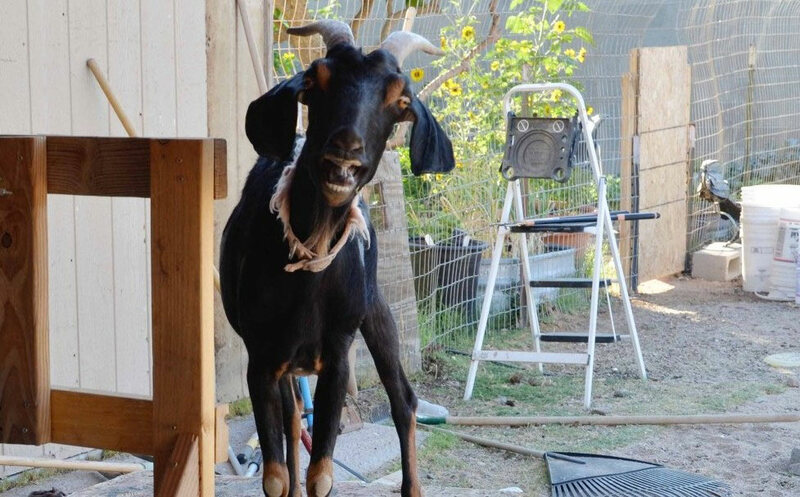 The goats are fed on alfalfa and left-over veggies from Tucson restaurant Rocco’s Pizza, ensuring the goat milk is some of the sweetest that cooperative members have tasted. 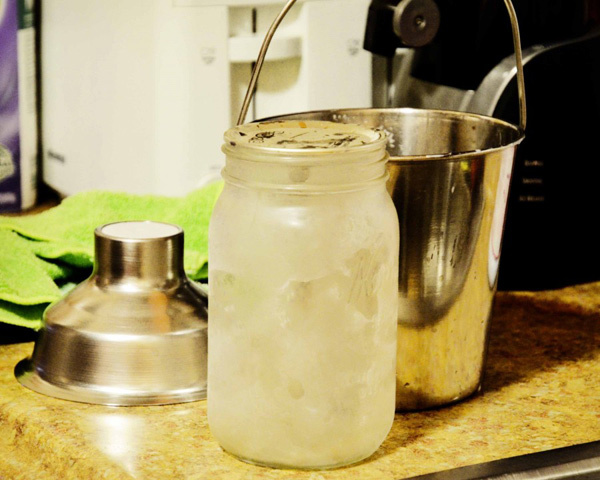 In addition to goat-milking, the cooperative has plans for classes on homemade yogurt, cheese, and soaps. Filtering the Milk. Photo by Darbi Davis. Back at Nana Aggie’s house, Ramon’s next endeavor is a water harvesting project, one using recycled materials that he hopes will also harvest the art and graffiti talents of many of his friends. The garden is eagerly awaiting its first sugar baby watermelon harvest. And Flowers & Bullets can rest assured that communities are warming to its mission. Read more about Flowers & Bullets in part one of the series. 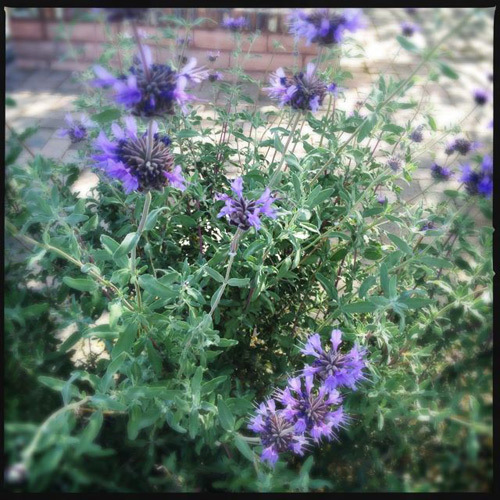 One of the most fragrant plants for any garden and especially loved by butterflies and hummingbirds, Chaparral Sage or salvia clevelandii sends out gorgeous blue-violet flowers. Give it a bit of space as it can reach 5′ tall by 5′ wide. You won’t regret it!